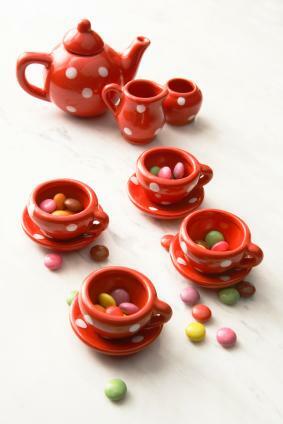 Giving a child a tea set is a great way to encourage pretend play. Whether you choose plastic, porcelain, or a specialty set, this toy is sure to become a beloved item in any child's playroom. Tea sets are good selling toys, and for good reason. They offer plenty of design options and encourage creative play. Look around at a number of shops to find the perfect set. Some will also come with a basket or other carrying case, linens, spoons, dessert plates, tea tray, and other items. Ritter's Teacup Gallery offers traditional floral designed, Victorian and English looking tea sets for children. All are FDA approved for use. Additionally, this company offers the option of mailing a check for purchase to the company, instead of ordering online. Find their address on the Company information page. Blue Moon Tea has several tea sets available, from traditional ones in baskets to an art deco design set. You can also order plenty of delicious teas from this company. Gift wrapping is available, perfect for sending a gift over the miles. Sign up for their newsletter to stay on top of their current promotions. The Teapot Shoppe has a wide variety of tea sets in a large price range. Choose from the traditional porcelain sets to unique ones featuring classic characters like teddy bears, Alice in Wonderland, fairies, or even Hummel figurines. Luxury sets, like the Lenox Butterfly Meadow Teen Tea Set, to affordable options, like the Lauren's Tin Tulip Tea Set, make this a great place to find whatever kind of set you desire. There's even a set you can personalize for the special child in your life. There are plenty of tea sets to choose amongst when it comes to picking one out for your little one. Before you decide on styles and patterns, consider which type of tea set will suit the needs of both you and your child. Plastic tea sets are best for pretend play, as some plastics may not be FDA approved for use as a food container. They are much cheaper than porcelain, china, or specialty sets, and wear well for their relative cost. You can often find them with popular trademarked cartoon characters from your child's favorite television programs and movies, like the Disney Princess Cinderella version at Amazon. These tea sets are also best for younger children who may be hard on their toys. Porcelain tea sets are a good option for older children who want a more authentic look to their tea set. They come in a variety of finishes, with beautiful designs that range from flowers to favorite fairy tale characters. Plain designs work well for either gender, like the Small World Toys It's a Party Tea Set available at Target. However, these sets can be more expensive than plastic play tea sets, and can also break or shatter. Give this type of set to a mature child who is sure to cherish it. Don't limit yourself to traditional tea sets. You can find them made of out tin, wood, or even fabric, like the tea set and case from Lillian Vernon. A specialty set is a good choice for a child who collects tea sets, or for a child with unique tastes. Specialty sets may be harder to come by than traditional plastic or porcelain versions, so check local children's boutiques and stores for these sets. Make tea time with your child even more special by baking small cookies and making sandwiches together. 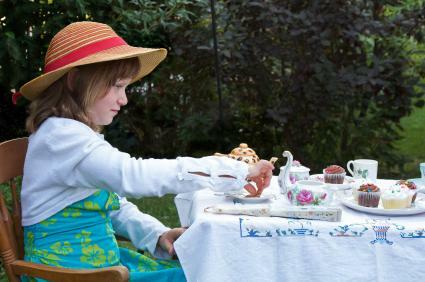 Add some water, lemonade, or flavored tea to the teapot and you are set for a true tea party! Your child won't forget sharing a cup of tea with their parents, siblings, and friends.